Whats the difference btwn s6802 n s6102 in :Battery power,operation,Size and any other.Kindly reply,am confused on which one to buy. AnonD-50519, 01 Oct 2012when pressing the power/lock button brings up the lockscreen in about 2-3 seconds, does this i... moreThe slow issue is related to your sd card. Have you tried the same operation without the sd? 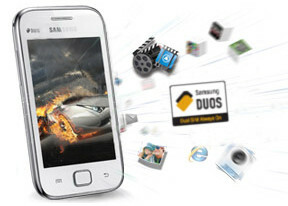 Sony Xperia Tipo Dual Vs Samsung Ace duos Vs Samsung y Duos......? m finding connectivity problem with d phone..
only sim 1 connects to internet..
can anyonme tell me how to connect internet with sim 2. AnonD-73116, 24 Sep 2012hi I bought this phone a week ago and had a GPS problem. My GPS need an online internet con... moregps does'nt work without any internet coonection bcoz it is a-gps. Amol, 28 Sep 2012Is there any one facing Handing problem while using the phone..? I brought this phone 15day... moreMy Father had the same phone. He told me he had a lot of network and stability issues. But when i looked into it, I found out Samsung has already rolled out updates for those bugs and fixed them. Now my device works very smoothly and no more network problem. which one is better to by. Please kindly replay.